Exercise Prolongs Life - Which Type, How Much and Best Intensity? It has long been claimed that active people who exercise regularly tend to live longer than those who have more sedentary lifestyles. But how much exercise is required, what type and what level of intensity is needed? Or doesn't it matter? More recent research has focused on the merits of short periods of high intensity exercise being more beneficial. Many people have welcomed this because shorter periods mesh in better with busy lifestyles. Recent research is clarifying many of the issues associated with exercise and improvements in life expectancy. This article reviews these research findings and provides a guide for helping you to life longer. A recent major European study examined 10 years of questionnaire data collected for about middle-aged white-collar Government employees in England aged 35 - 55. The information included the number of hours spent exercising, including performing housework, walking, gardening, playing sports (running, swimming, team sports, cycling, golf, etc.) and general house maintenance and various others such as do-it-yourself repair projects. Each activity was assigned a grade in terms of intensity from “mild” to “vigorous,”. The researchers then examined the death records for the civil servants and looked for correlations between length of life and exercise regime. The study found that any type of physical activity provided benefits for longer life. But intense physical activities were better intense. These finding agreed with those of a study in Copenhagen that monitored about 5,000 adult recreational cyclists over a period of 18 years. The subjects were regularly asked about the intensity and duration of their rides each day. The researchers accessed death records for each group. Men and women who rode relatively intense bike rides (not races by hard cycling) lived longer than those who rode leisurely. The intensity appeared to be more beneficial than the duration. On average, cyclists who trained hard lived about 4-5 years longer than the others. Other research has suggested that the amount of time spent exercising and its frequency are really important. Its been suggested that it is the total amount of energy expended in exercise each week that is important. Short sharp bursts of intense work are beneficial but you have to do enough of them spread over days or weeks to get the benefit. Likewise a leisurely walk may consume much less energy than a sprint over the same distance, but if the walk is continued for 3-4 times the distance it will provide the same work-out value, provided the paces is brisk not a stroll. 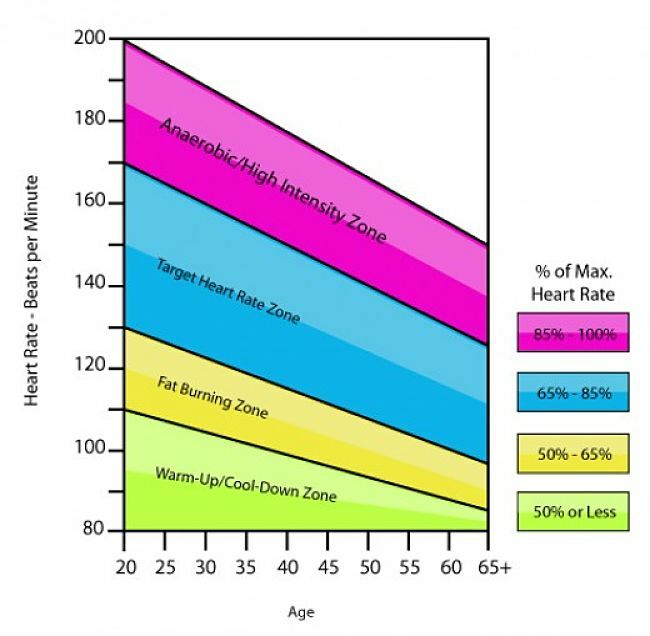 The chart below shows how intensity is related to heart rate and how it varies with age. 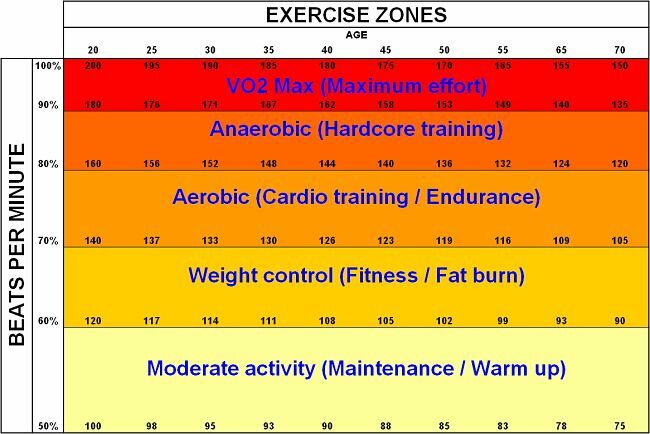 Heart rate monitors are a good tool to ensure you are working at your designated level of intensity for your age. A recent major study conducted by the National Cancer Institute and other research centers provided even more detailed information from a study of 650,000 American adults. Data were available on their body mass (BMI), physical activity and length of life. 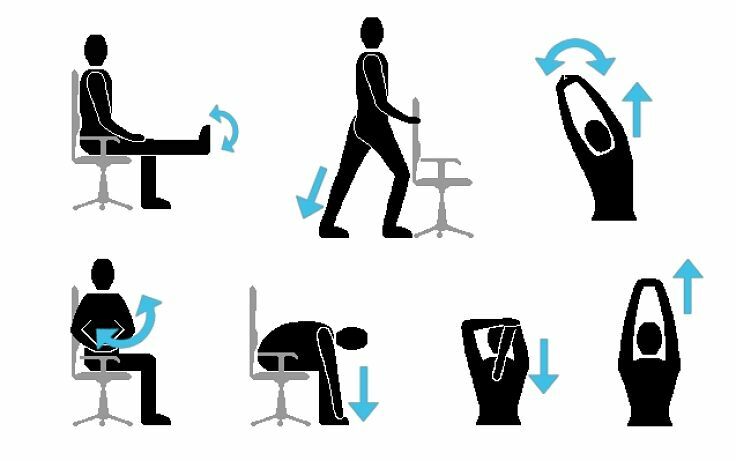 The researchers compared the activity levels for the various types of activity against the US Department of Health and Human Services Exercise Guidelines (HHS Guidelines). 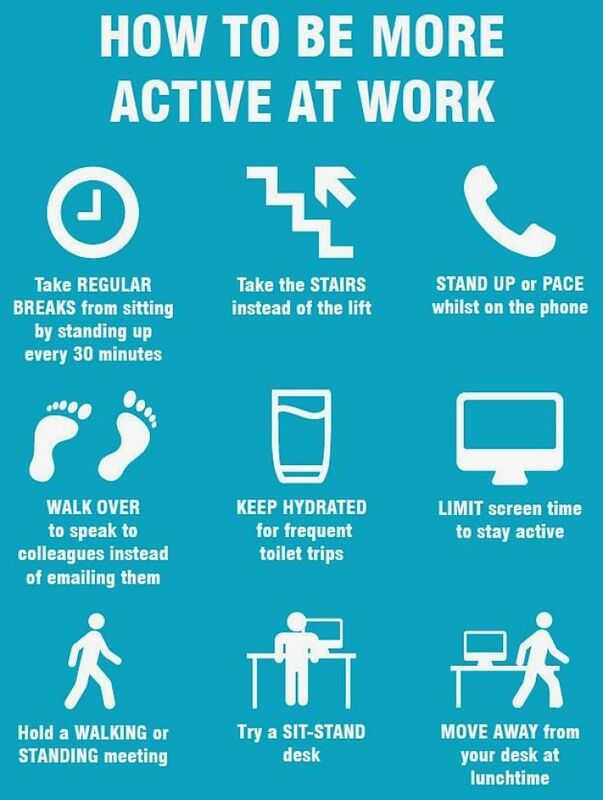 Details of these recommendations are shown below which is basically 150 minutes of moderate activity per week. Brisk walking and riding are moderate activities. 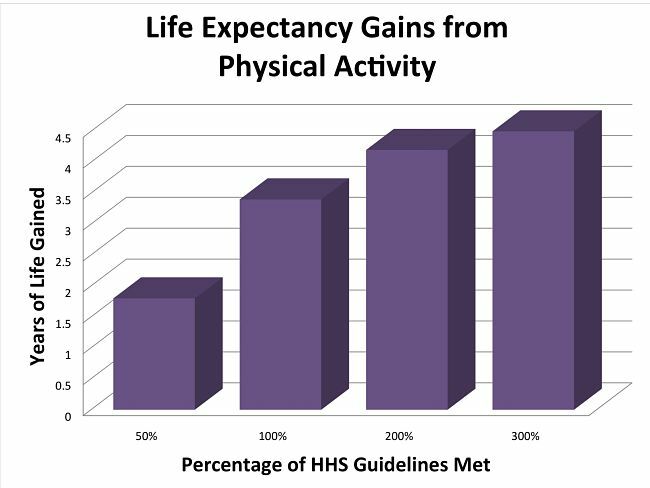 The study found that people whose exercise patterns met the HHS Guidelinesextended their life span by an average 3.4 years compared with people who didn’t exercise, or who only exercised at 50% of the recommended level. People who exercised at twice the HHS guidelines and three times that levelgained an extra 4.2 and 4.5 years, respectively compared with sedentary people. These results are summarised in the graphic show below. The benefit of physical activity to prolong life was demonstrated for people of all weights and sizes. BMI was used as a measure of weight and whether the subjects were overweight for their height. Being active and having normal weight gave a predicted gain of 7.2 years compared to being inactive and being very obese ( class II+ obese - having a BMI of more than 35.0 kg/m2). Being active and having normal weight gave a predicted gain of 3.1 years compared to being inactive and being moderately obese ( class I obese (having a BMI of 30–34.9 kg/m2). In the graphic below the combined effect of excess weight and inactivity are shown as a loss of years for a life. The color codes are: Dark Purple - Exercise pattern met the HHS Guidelines; Purple only half the HHS guidelines and Mauve - Inactive. 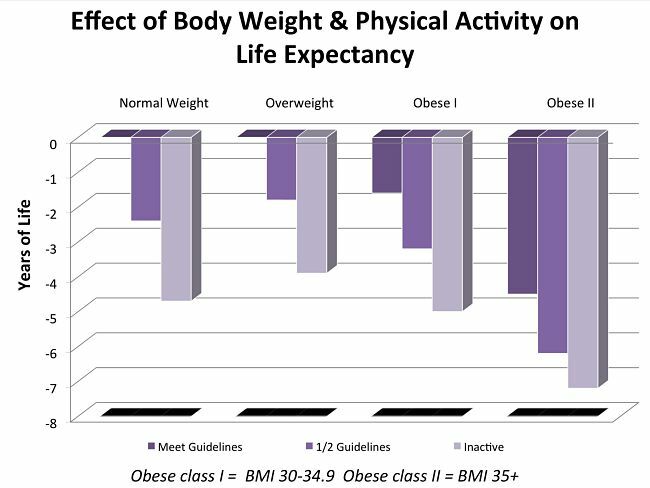 In the worst case being obese and sedentary leads to an average reduction on life expectancy of 7.2 years. => hiking uphill or with a heavy backpack. Aerobic activity should be performed in episodes of at least 10-15 minutes. For boosted health benefits, adults should increase their aerobic physical activity to 5 hours a week of moderate-intensity exercise or 2 1/2 half hours a week of vigorous-intensity aerobic physical activity. Adults should incorporate muscle strengthening activities, such as push-ups, sit-ups, weight training and carrying heavy loads or heavy, active gardening, at least 2 days a week. Older adults should follow the guidelines for other adults when it is within their physical capacity. If a chronic condition prohibits their ability to follow those guidelines, they should be as physically active as their abilities and conditions allow. If they are at risk of falling, they should also do exercises that maintain or improve balance. One hour or more of moderate or vigorous aerobic physical activity a day, including vigorous intensity physical activity at least three days a week. Examples of moderate intensity aerobic activities include hiking, skateboarding, bicycle riding and brisk walking. 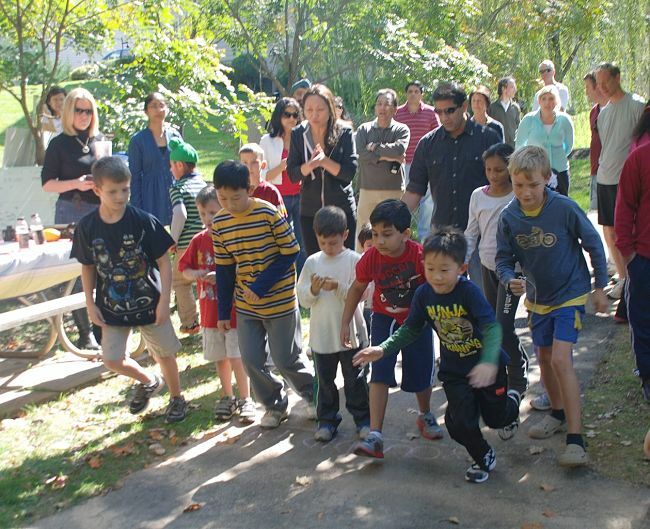 Vigorous intensity aerobic activities include bicycle riding, jumping rope, running and sports such as soccer, basketball and ice or field hockey. 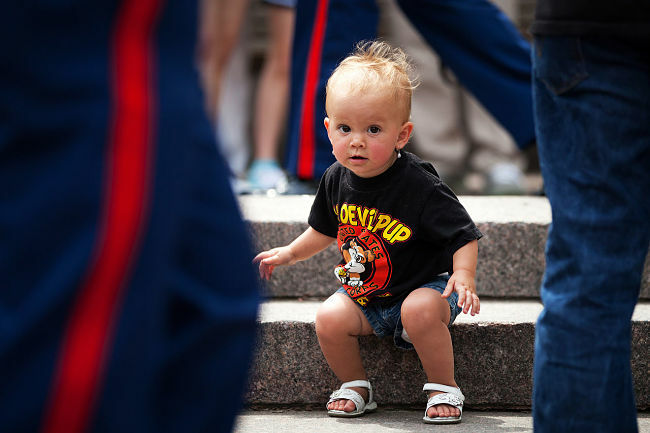 Children and adolescents should incorporate muscle-strengthening activities, such as rope climbing, sit-ups, and tug-of war, three days a week. Bone-strengthening activities, such as jumping rope, running and skipping, are recommended three days a week. 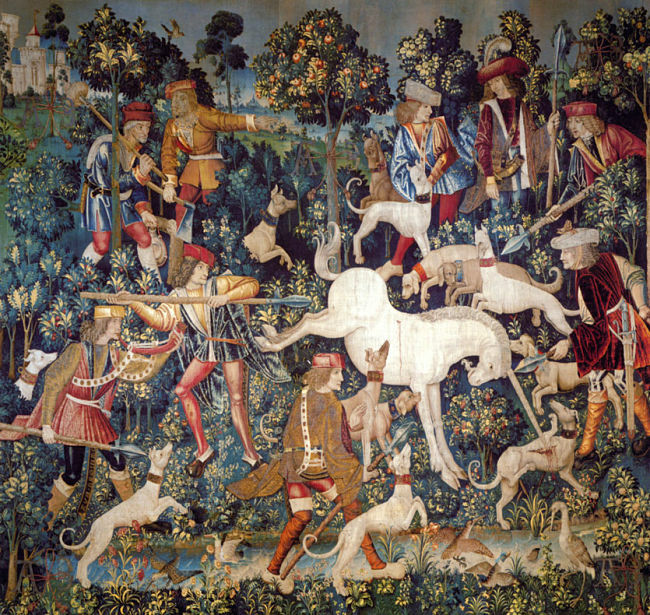 The two tables below provide details on what is known about the benefits of the major types of exercise on length of life and how exercise affects common ailments that contribute to premature death. A study of Copenhagen cyclists found men who pedaled the faster lived more than 5 years and the faster women 4 years longer. Nother study showed that climbing more stairs boosted the benefit. 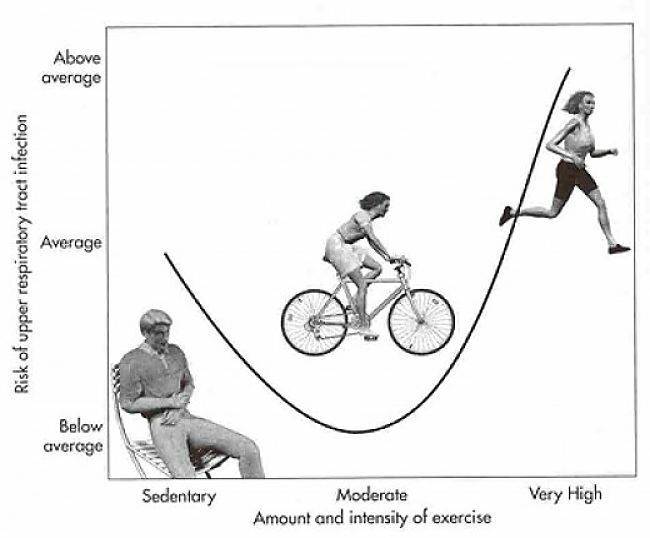 Reaserch suggests that intense exercise may double the kife expectancy of moderate exercise. Walking for 30 minutes a day added 1.3 to 1.5 additional years. Brisk running for 30 minutes five days a week, extended life by 3.5 to 3.7years. Data from the Aerobics Center Longitudinal Study showed that regular swimmers rediced their mortality risk by 50 %. Swimmers also shpwed lower mortality rates than those who ran or walked for their exercise. A 2011study found that people who walked at 1m per second, or about 2 mph, or faster, lived longer than those that walked regularly, but at a slower pace. Many claim that you only get real benefits from a workout lasting a minimum of 30 minutes. But recent studies have shown that short high intensity workouts can be just as beneficial. A study in 2011 found that just 15 minutes of daily activity, like brisk walking, or working out added three years to life expectancy. Extensive analysis of current research publications showed that the benefit of the regular exercise is roughly equivalent to the continuous use common medications allowing people to remain active without long term use of drugs. A Duke University study in 1999 concluded that 16-weeks of aerobic exercise was as just as effective as antidepressant medication in controlling depression for people over 50 years of age. A 2007 study in Boston over a 10 year period, involving 27,000 women, found that 5-hours of moderately intense exercise per week reduced heart disease risks by 41%. Those who exercised 2-5 hours weekly showed a 32% reduction, 1-2 hours, a 27% reduction. Research studies have shown that regular exercise helps maintain stronger bones and reduces the risk of fractures with falls. A study in 2010 of 227 women aged over 65 show those who has regular gym sessions had higher bone mineral densities and had 66% less the falls. The Aerobics Center Longitudinal Study measured the general fitness and health of about 2,500 men and women over the age of 60 years - weight, waist circumference, body fat and various measured of fitness. Over a 12 year period the group with the lowest level of fitness and lowest activity levels had death rates 4 times those of the fittest group. Studies have shown that regular moderate to high intensity exercise lowers the risk of stroke by about 60%. A study conducted by the National Institutes of Health involving more than 3,000 people at risk for diabetes, showed that the peak group who lost about 5-7% of their body weight and exercised 150 minutes per week, showed about 50% percent reduced incidence of diabetes. Another similar study over 10 years showed a 34% reduction.